Drone operator Steve Blizzard of Aerial MOB shot a single 2-minute continuous clip opening for the Dancing With The Star‘s premiere. Watch this beautiful sequence! Aerial MOB, a top Hollywood aerial filming company among the first six companies to get a 333 exemption to commercially fly and operate drones in the U.S., has shot with a drone an amazing 2-minute continuous clip used as the intro to this year’s Dancing With The Stars premiere. Dancing With The Stars is a popular American dance competition television series first aired in 2005 on ABC. The above video, shot in the scenic grounds of the Los Angeles Griffith Observatory, was used in the premier of the 23rd season. Choreographed by Mandy Moore and directed by Daniel Martin for Dancing With The Stars, the drone-filmed performance features all of Season 23’s Celebrity Contestants and Pro Dancers dancing to “On Top of the World” by Imagine Dragons. The pilot of the drone was Steve Blizzard. 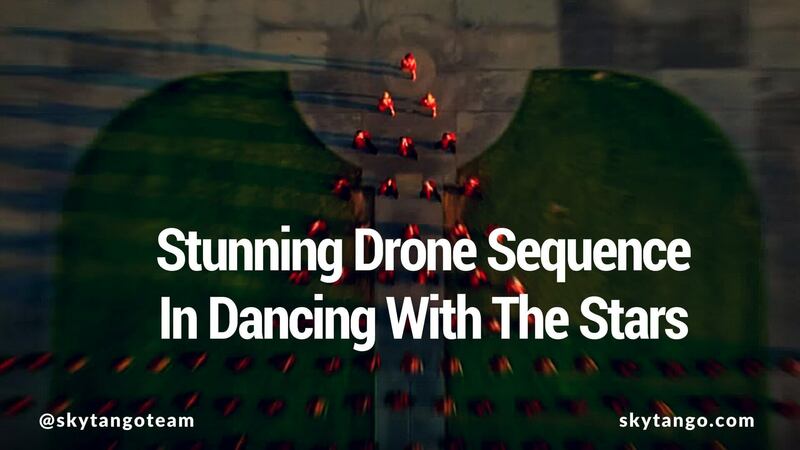 The initial sequence of the video is a brilliant display of top technical expertise which required a huge level of precision and tight communication between the Aerial MOB drone crew and the Dancing With The Stars production team. It was shot during golden hour, after 2 days of rehearsal, in one continuous two-minute clip. The drone was a DJI Inspire with XR5 camera and Olympus lens, manually guided by Steve Blizzard and always kept within line of sight. You can actually catch a quick glimpse of the drone as a shadow running across a wall and staircase at the 0:25 mark. This single shot would be impossible to obtain with a manned helicopter and certainly difficult with other rig set-ups and it reveals how drones can be creatively used to obtain stunning results. The top-notch skills professional pilots can nowadays display in aerial cinematography is amazing. Imagine what Orson Welles could have done with a drone in the opening shot of ‘A Touch Of Evil‘! Don’t forget to check Aerial MOB’s website for further exciting drone footage! Wow! Steve Blizzard is amazing! This dance sequence is awesome and very technical. I wonder how many takes it took them. I hope to see more productions like these utilizing drones and all their capabilities! Did they use dual operators? I only have a Phantom 4 but cant wait to get my hands on an Inspire.